A software that can serve as your personal physical fitness trainer, eliminating the need for tedious data-recording. The human mind has never been put under greater pressure before. With the advent of internet bringing onto a new era connectivity allowing us to access the world at our fingertips, it has also made us less physical. Studies after studies have gone on to provide evidence on the detrimental effects of lack of exercise on physical and mental health. Asking all medical specialists - physical fitness remains one of the best ways to prevent and improve the human mental condition. That's why we created MyoVision, to provide a tool for everyone that might need that helping hand, but might be unable to afford an expensive personal fitness trainer. This program, used alongside the Myo Armband is testament to the progress of human ingenuity. In the past, there have been applications where you can keep track of your physical fitness via checking in and tracking the app, but it was always based on the person's true intent and honesty. Introduce Myo. 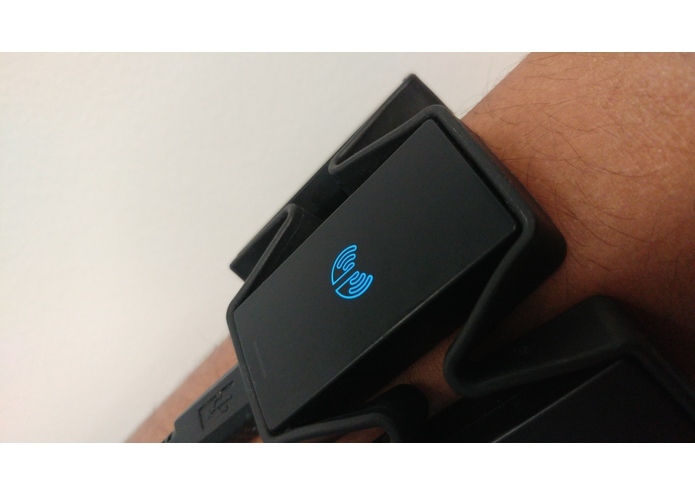 Myo armband keeps track of what exercise you're currently doing and how many times (reps) you're doing it, to ensure maximum effectiveness, all autonomously without the user having to physically type anything in. And if you fall short of your goal? You're going to see $0.50 donated to the Canadian Mental Health Association (CMHA) every time! It goes to a good cause and promotes the risk-regard behaviour, including the individual to work harder to stay more physically fit. We built this program using C/C++, having used the raw gestural and spatial data coming from the Myo armband, to categorize, synthesize, and progressively analyse with various regression techniques to determine the optimal values that best highlight the individual doing a push-up or a sit-up. Exercises like bench-presses have not yet been placed into this software due to the physical restrictions of being unable to access such weights during the hackathon. When we were still considering Alexa, we used all tech associated with Alexa including: Node JS, AWS Lambda, Python, Bash and JS. We are extremely proud of having created a routine - one where you can slip on a Myo Armband, work out, and watch as the data of your workout is seamlessly and automatically stored on your computer. We learnt about the intricacies of combining two hardware technologies - notable the Myo and Amazon Echo (Alexa), and the usability of C++ as a multi-disciplinary language. Next, MyoVision plans on including more exercises to its list, and become voice activated!